Wow. It’s very telling that Washington state television has reached the level of sophistication of California media when it comes to sharing civic issues specifically with its Spanish-dominant Latino population! I recently read that a California gubernatorial debate was broadcast in both English and Spanish. Not surprising. Well, Washington is right up there with California, reminding all that 1) government issues are relevant to Washington state Latinos and that 2) Latinos are relevant to our state’s government! This is all thanks to the presence of Vme in much of Washington and its partnerships with KCTS 9, which hosts the local affiliate in partnership with Washington State University. Vme is the national Spanish-language network that produces public programming that is educational as well as fit for the whole family. We are lucky here to have access to that national resource which also features important local programming. KCTS 9 aired their Ask the Governor program last Monday with Governor Christine Gregoire—live, and complete with calls and emails from concerned citizens. This was another significant opportunity for Washington voters and residents to learn about the pressing issues we face—and just in time for our upcoming elections. The local Vme affiliate again collaborated on this important project. Not only is the entire program dubbed in Spanish for airing on local V-Me, but Tony Gomez and team worked to create additional integration between the two airings with questions in Spanish from Latinos. So, while most of the questions for Governor Gregoire were in English, there were a couple in Spanish. The key is this: These particular questions weren’t included just for the Spanish-language program, but aired on the original English-language program with English dubbing or subtitles. On the Spanish program, Vme will be stripping that layer and Latino viewers will hear from people in their own community. Not only does this enrich the program by collecting more diverse viewpoints, but it shows that 1) Washington state does indeed have a great Latino constituency, and 2) that demographic is actively invited to join the process of getting informed about important issues that will affect them, too. 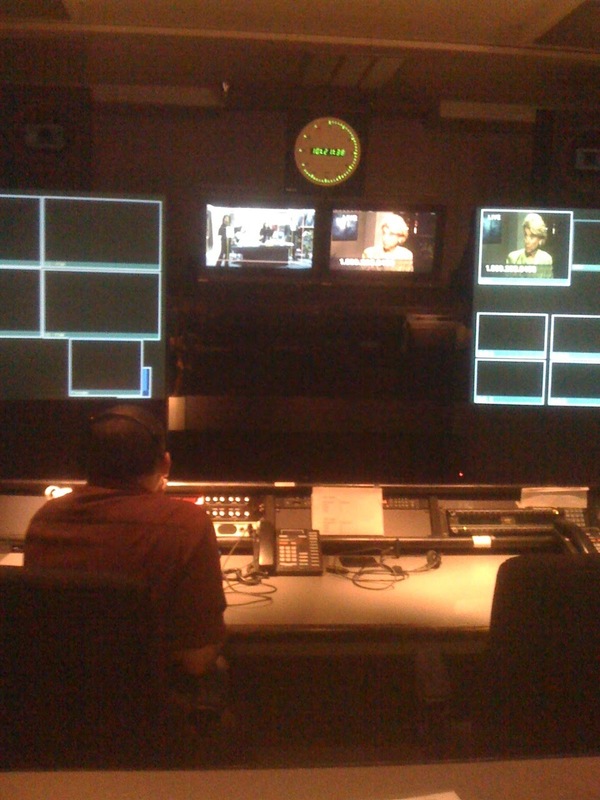 I witnessed a piece of this process, when professional interpreters were brought in to produce the voiceovers for Enrique Cerna (the show’s host), Governor Gregoire, and questions from the public. It was a great opportunity to see the kind of devotion KCTS 9 and Vme have to make important, local content accessible to the Latinos of our state. Tony Gomez, who practically runs Vme single-handedly, hails from California and has for years been pushing for better communication and involvement with Washington State Latinos—something that is becoming more and more critical as our state’s Hispanic population has topped 600,000. Pregúntele a la Gobernadora will be aired in Spanish on Vme at 7pm this evening. Vme can be viewed over the air (with a digital tuner) on 9.2 in the Seattle area/Western Washington and on 47.2 in Yakima and Central Washington. (Cable channels are Comcast 119 in Western Washington, and Charter 297 in Yakima/Central WA.) For more information about Vme in Washington, visit their site or KCTS 9 Vme on Facebook. The Spanish-language program is also available now via the KCTS 9 site. of the U.S. Senate Debates. The Vme broadcast will air next Friday, 10/22 at 7 pm. It’s rumored that KUNS will try a simultaneous broadcast of this Sunday’s debate.